Lovina’s peaches ready for winter. We had a nice few days staying by the lake. Our family enjoyed fishing and swimming. We had some very hot days so it was nice to be close to the lake. Thanks to my friend Ruth for writing the column for me last week. We attended the wedding of Leander and Karen. Joe’s Uncle Solomon and Aunt Nancy from Ohio joined us at Timothy and Elizabeth’s house for supper. Joe helped Timothy unload some hay. We had a good supper with barbequed chicken on the menu. Solomon and Nancy came to our house for the night. I made breakfast for all of us before they left the next morning. We enjoyed having them here! On September 2 our youngest child Kevin turned ten years old. He was excited to go to church as he gets to sit with the boys now instead of with Joe. When the boys and girls turn ten, they can sit with the girls and boys ten years and older. School started yesterday and Joseph, Lovina, and Kevin had a nice first day of school. 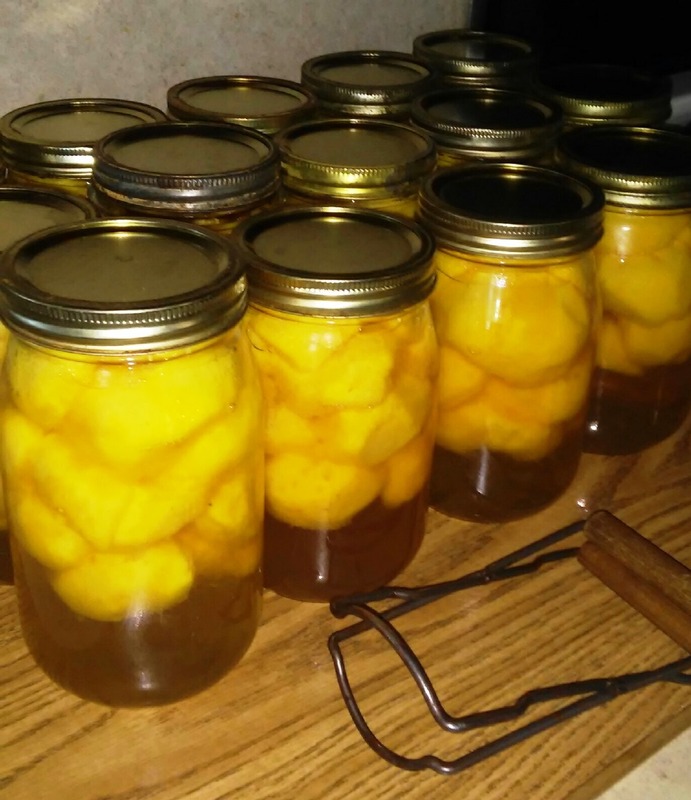 We have peaches here that need to be canned. I’ll probably put some in the freezer too. Last week Timothy’s sister had a Norwex shower for Elizabeth. I had never been to a Norwex party (cleaning products that are chemically safer). Elizabeth received all the hostess benefits. A wash line was also presented to Timothy and Elizabeth that night. Family members had filled gallon, quart, or sandwich size bags with small gifts for Timothy or Elizabeth. It was interesting to see what people came up with. An example of items in the bags were soup plates, bowls, spices, seasonings, kitchen items, nails, screws, baking supplies, buttons, pins, needles, band aids, etc. They received a lot of nice things. The bags were all pinned to a clothes line hung outside with clothes pins. Sunday our neighbor girl Ruth was published to be married on October 16 to Aden. Aden is also a member of our church. I was asked to help cook. Joe was asked to help wash dishes at night. Loretta was asked to be a babysitter. The babysitters help watch the cooks’ babies and toddlers. Loretta and I both need to have a new aqua dress sewn for this wedding. On Saturday sister Liz and Levi are hosting our family gathering. I’m not sure what the exact number is for our family count now, but I know it’s over one hundred. Next year it will be our turn to host the gathering. It seems like the family has been together more this year since there were a few weddings in the family. I am hoping to answer the letters to readers this week. I apologize for taking this long to answer some of the letters while we were so busy with the wedding and church services. Thank you so much for your patience. God bless you all! Try this peach crisp recipe while peaches are in season! Place peaches in the bottom of an 8 inch square baking dish. Sprinkle with almond extract. In a bowl combine flour, sugars, cinnamon, and salt. Cut the butter into the flour mixture until it looks like crumbs. Sprinkle the flour mixture in an even layer over the top of the peaches and sprinkle the oatmeal on top. Bake at 375° for about 45 minutes until peaches are bubbling and topping is browned.